Like-minded people everywhere are free to take their cans of Pabst Blue Ribbon, raise them to their mouth and actually swallow as many ounces as they see fit. Please. Do so all you’d like. The joke’s on you. The stuff is rubbish. Just a quick anecdote. I encounter literally dozens upon dozens of homeless people and SRO basket cases every day no matter what direction I’m walking in, and I never see any of these folks (all of whom like to drink) with a PBR in their shaking, begrimed paws. Steel Reserve 211, yes. Tecate, yes. Even Lagunitas IPA at times! But never Pabst.) Think about that for a moment. People who have systematically destroyed whatever varying amount of brains they were born with through alcohol and drug abuse and falling over and hitting their heads on the unforgiving hard plastic seat corners of municipal buses still have more sense than to take up their daily position against the wall of the San Francisco Public Library with a sixer of Pabst Blue Ribbon at their side. But some bearded, upper tax-bracket mollycoddle in $200 Scotch & Soda skim jeans and a Filson buffalo check lumberjack coat will elbow up to the bar and heartily guzzle it down and even pretend to enjoy it. Why? There must be a reason for it, but the modern American hipster is one head space I’d rather not poke around in. I value my sanity. So, as I said, “they” can have it. 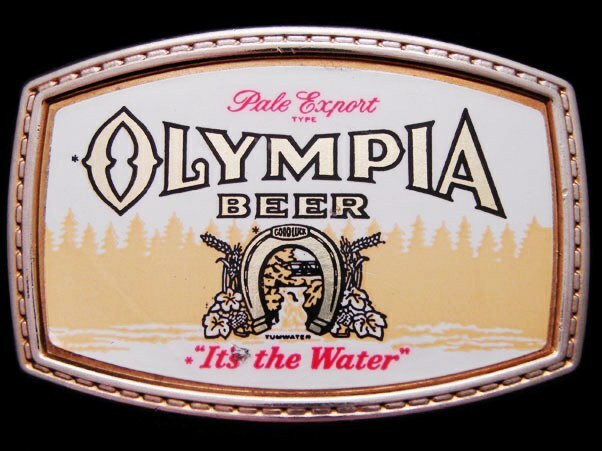 Why this bellyaching about Pabst Blue Ribbon in an entry about Olympia Beer? Well, it’s because, in the 80s, they bought Olympia and wasted no time in irrevocably ruining it. They changed the recipe to one of their stock penny-pinching formulas, and cut the price of an already inexpensive beer to Meister Brau-like levels. That was it, the jig was up, my beloved Oly went from being a delight to undrinkable. Before all this, it had magic, it really did. Yes, I know it was a middling grocery store lager and not Rochefort Blue Cap–no one’s trying to claim it was some world-beater brewed by an expat band of Trappist monks who immigrated to Thurston County, WA during the chaos of World War II. But damn, for $2.99 plus sales tax for six of ’em, you received a smooth, crisp drink that just plain tasted good. Refreshing, even. It’s hard to explain, but trust me, it was delicious. And when it changed, the difference was shocking. It still exists today, brewed in California–a good thousand miles from the mythical Artesian wells. And hey, it’s even got a lot of the same sort of retro, working class fake cool that PBR makes a living on. But it hasn’t been the same for a long, long time.